Welcome to the world of Bamboo Teas! For hundreds of years bamboo leaves have been used in both Chinese and Ayurvedic medicinal teas. Not only is it a sustainable crop, it can be used to make a tea that's good for you! Bamboo leaves have some of the highest concentrations of vegetable silica, the mineral that makes bamboo grass grow strong, tall and flexible. Silica is great for maintaining hair and nail health. Bamboo leaf tea also contains 1 gram of soluble fiber per 8oz cup and is a good source of micronutrients and antioxidants. The natural flavour of bamboo tea is sweet, complex and mildly grassy for a fresh, light tea! 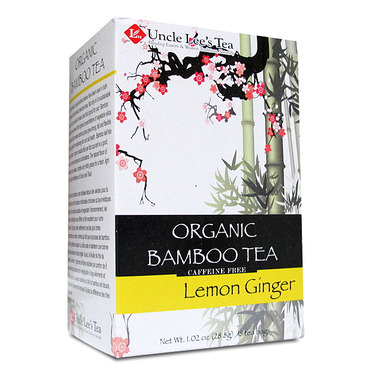 Our Bamboo Teas are certified organic and caffeine-free, unlike many other commercially harvested Bamboos. Organic means healthier for you, without all the modern toxic chemicals in the production process. For this flavour, you will appreciate the tangy lemon added in combination with the powerful ginseng. This flavour combination is perfect for most people who enjoy lemon flavoured tea and also want an extra health benefit of ginseng. Taste the difference of Uncle Lee's Tea! Packaged in air-tight foil tea bags for guaranteed highest quality of freshness that you come to expect from Uncle Lee's. Certified Organic by QAI.